I hope everyone is having a great holiday season. And here’s to another great year in 2010! Wherever you’re ringing in the New Year tonight, be safe and have a blast. I’m back home in Chicago and will be off for a little while, so expect the blog to remain quiet over the next week and a half or so. Next time I blog, it’ll be 2010 and we’ll all be one step closer to Spring Training. Happy New Year everyone. Could this be Toronto’s Opening Day rotation? There’s a good chance, now that Blue Jays general manager Alex Anthopoulos has finalized a trade to bring right-hander Brandon Morrow north of the border. The way things stack up right now, you could be looking at a rotation of Ricky Romero, Shaun Marcum, Marc Rzepczynski, Brett Cecil and Morrow. Not too bad, if you ask me. Not going to win the East, but that’s a starting five with plenty of upside. If Marcum’s healthy, he’s in. After winning 13 games last year, Romero is a virtual lock as well. Cito loves Rzepczynski and Cecil would seem to have the best shot of landing the fifth spot at the moment. Other pitchers in the mix are David Purcey, Scott Richmond, Brad Mills and Robert Ray. Don’t forget about recently-acquired Kyle Drabek, who could be a darkhorse candidate, though the addition of Morrow helps the Jays send Drabek to the farm for more development. The same would seem to apply to guys like Zach Stewart and Reidier Gonzalez. Casey Janssen and Brian Tallet seem destined to wind up back in the bullpen. If the season started today, what’s your starting five? Morrow to the Blue Jays? The Blue Jays have reached a tentative agreement with the Mariners on a trade that would bring right-hander Brandon Morrow north of the border. In order to land Morrow, the Blue Jays have agreed to trade right-handed reliever Brandon League to the M’s. Toronto will also send a prospect, and I’m hearing it’ll likely be Minor League outfielder Johermyn Chavez. On Tuesday, League was headed to Seattle for a physical and Morrow was en route to Tampa to do the same. Announcement is expected to come on Wednesday. More than likely, Morrow will be brought to Toronto as a starter. He would immediately be among the top three arms in the mix for rotation spots. With Morrow in the fold, the front five actually begins to take shape. You have Shaun Marcum, Ricky Romero, Marc Rzepczynski, Brett Cecil and now, presumably, Morrow. There’s also Scott Richmond, Brad Mills, Robert Ray, David Purcey and the whole cast of youngsters. Kyle Drabek maybe, too. Last year, Morrow went 2-4 with a 4.39 ERA in 69 2/3 innings for the Mariners and 5-3 with a 3.60 ERA over 10 starts with Triple-A Tacoma. 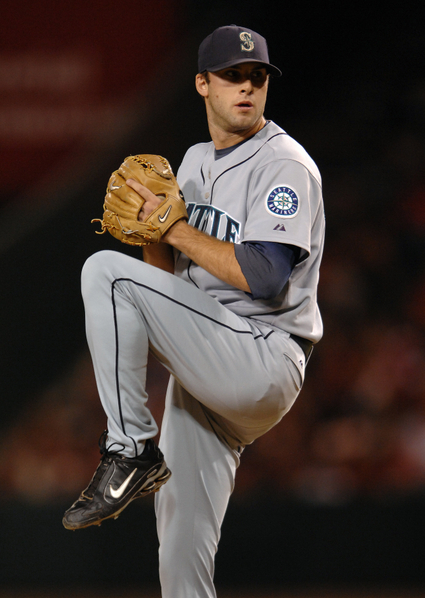 Morrow has gone 8-12 with a 3.96 ERA in 197 2/3 innings for his career with Seattle. In 15 career starts with the Mariners, he has gone 4-3 with a 4.42 ERA. It’s done. The Phillies are planning a press conference for 5 p.m. to unveil ace Roy Halladay as the newest addition to their staff and the Blue Jays will hold a press conference at the same time in Toronto. After some last-minute drama — online reports indicated that one of the Minor Leaguers involved in the four-team trade between the Jays, Phillies, Mariners and A’s failed a physical — the clubs put the finishing touches on the offseason blockbuster. The Blue Jays then traded Taylor to Oakland for prospect Brett Wallace. The official announcement for the four-team, nine-player deal that would send Roy Halladay to the Phillies and Cliff Lee to the Mariners was expected to come today. Right now, there appears to be some sort of hold up. I’m hearing that it is not Halladay or Lee and Shi Davidi of the Canadian Press has confirmed that it is not Phillippe Aumont (going from M’s to Phils in the proposed swap). UPDATE: Larry Stone of the Seattle Times reports that the issue is not with any of the Mariners prospects. UPDATE: That leaves Brett Wallace, Michael Taylor, Kyle Drabek and Travis d’Arnaud. My money is on it being either Wallace or Taylor, but I don’t have that confirmed at all. UPDATE: Hearing that it’s done and the Jays plan on holding a press conference around 5 pm. @jonah_n Still think it’s not enough; Aumont should be coming to Toronto. @MatthewKlekner good deal if it’s Drabek. Not as much if it’s JA Happ. @Pagal4321 Seems like a rip-off to me. But then again, so would any deal. Love the Doc! @DarrylSalach not enough. The Jays will need the top 3 prospects from the Phillies and the top 3 prospects from the Mariners to make the deal. @mainevent360 Missing a Seattle prospect to T.O. otherwise there would be no need for this to be a three-way trade. Regardless I’m pleased. @eric_epp I woulda been happy with that at the deadline. now? AA is a genious! @steveconelley I’d rather get Saunders in there somewhere. @talkinghomer I considered myself a HUGE Halladay fan. The deal had to be done though, and I’m glad they got they got 2 Top 50 prospects. @OneToolPlayer Brutal. At least 1 of Brown or Saunders or I’m unhappy. @ilanbaron good job AA , don’t think J.P could pull it off. @CutlersBarber Pretty solid. Thank god JP didn’t trade him in July for the Happ, Donald, etc. poop platter. Halladay to Phillies in 3-way blockbuster? Reports are running wild indicating that Roy Halladay is on the verge of being dealt to Philadelphia in a three-way trade possibly involving Cliff Lee and the Mariners as well. I’ve heard that Lee will wind up in Seattle, Doc in Philly, and prospects from both sides would be headed to Toronto. Some names being mentioned are Phillippe Aumont, Dominic Brown and Michael Saunders, among others. Nothing is confirmed or announced at this point. I spoke with Lee’s agent and he said he had not been informed of the trade as of early Monday afternoon. But, keep in mind that Lee does not have a full no-trade clause like Halladay. So, even if Lee wants an extension — much like Doc is reportedly talking about with the Phillies — the lefty doesn’t have the power to block a trade. UPDATE: According to ESPN.com’s Jayson Stark, Halladay is talking with the Phils about an extension worth roughly $60 million over three years with a vesting option that could make the deal a year or two longer. A source told me that an official announcement, barring physicals and the extension talks, would likely come Wednesday at the earliest. UPDATE: An online report indicated that the Blue Jays agreed to a one-year deal worth around $1 million with catcher Ramon Castro. Toronto might announce the signing of catcher John Buck on Tuesday. Perhaps Castro will be announced as well. UPDATE: Hearing that the Blue Jays may actually be receiving Drabek, Taylor and d’Arnaud from the Phillies and Philadelphia would be receiving the Seattle prospects. Aumont likely headed to the Phils. The Blue Jays agreed to a one-year contract with free-gent catcher John Buck on Sunday, according to an industry source. General manager Alex Anthopoulos declined comment. Buck — non-tendered by the Royals on Saturday — has agreed to a contract believed to be worth $2 million for the upcoming season with the Blue Jays. Buck became expendable for Kansas City after the Royals signed veteran catcher Jason Kendall to a two-year contract on Friday. Buck, 29, hit .247 with eight homers and 36 RBIs over 59 games with the Royals last season. Over six years with Kansas City, the catcher has hit .235 with 70 homers and 259 RBIs over six seasons. So, that report about outfielder Joey Gathright signing with the Jays on Thursday was false. Turns out he signed with the Blue Jays today instead. 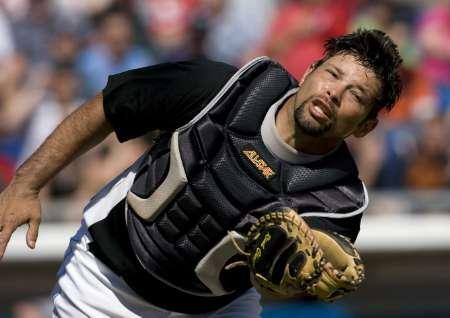 The news that Toronto had parted ways with catcher Raul Chavez by non-tendering him on Saturday night? Well, they did that, but they brought him back on a Minor League contract on Sunday. Gathright and Chavez will both be brought into camp this spring with a shot at a spot on the Opening Day roster. Gathright might be in the mix for that vacant leadoff spot, and Chavez is in the running for the same backup catching role he filled for most of last year for Toronto. 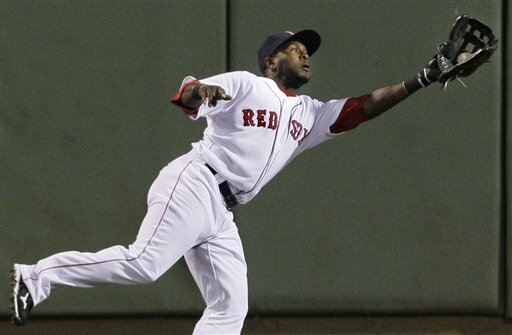 The Jays are likely still looking at outfield and catching options, though. Chavez is now off the 40-man roster, meaning there are no catchers on that list. 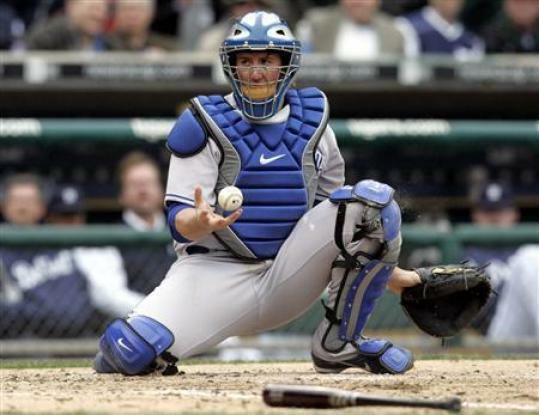 Toronto might be looking for another backup option to go along with their new starting catcher. Ryan Doumit and Mike Napoli are the names most recently tied to the Jays inn trade speculation. Beyond the moves involving Gathright and Chavez, the Blue Jays also avoided arbitration with utility man Jose Bautista and pitcher Dustin McGowan on Sunday. Bautista will earn $2.4 million — the same salary he had last year with Toronto — and McGowan will make $500,000. McGowan has pitched since 2008 and he remains a big question mark heading into the spring. The Blue Jays did not tender a contract to catcher Raul Chavez before Saturday’s midnight ET deadline, making him a free agent this offseason. This seems to make it pretty clear that the Jays have some things working on the catching front, though general manager Alex Anthopoulos was not immediately available for comment. Toronto does not have a catcher currently on the 40-man roster. Rod Barajas — last year’s starter — is a free agent as well and he is not expected to re-sign with the club. Catching prospect J.P. Arencibia likely needs more time on the farm. On the trade front, the Jays have been linked to Pirates catcher Ryan Doumit. Toronto is also believed to have interest in Angels catcher Mike Napoli. Coincidence or not, the Angels are pegged as the front-runners to land ace Roy Halladay from the Jays in a trade as things currently stack up. All other arb-eligibles were offered a contract before Saturday’s deadline. That list includes Jose Bautista, Shawn Camp, Jason Frasor, Brandon League, Shaun Marcum, Dustin McGowan and Brian Tallet. Oh, and Jeremy Accardo, whose agent said on Friday night that the pitcher hoped to be non-tendered. My guess here is that the Blue Jays will try to find a match for Accardo in a trade, or maybe try to package him in a larger deal. Accardo could also come back to the Jays for the 2010 season, but it sounds like he wants a fresh start with a new organization.